Rehn is a 2½-year-old black male who was originally found as a stray by Texarkana Animal Control. Helga Simeone is a volunteer at this shelter and could not leave this sweet boy there, so she took him into her home which consists of a lab puppy and a greyhound who is very sick from Ehrlichia. Helga took him to a local vet to have him checked out, only to find out he had heartworms. 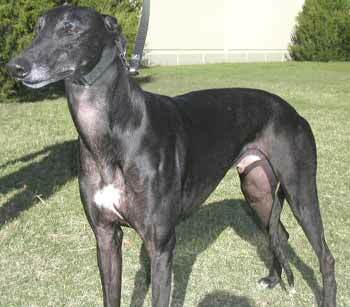 Because of her older greyhound's medical needs and condition, Helga contacted GALT to bring him into our program. Rehn has been treated for heartworms and now has a clean bill of health. Rehn's foster mom, Sadie Pack, did a greyt job of helping him recuperate. 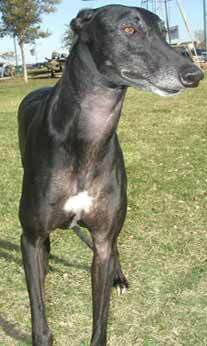 Sadie describes Rehn as a very sweet, affectionate and kind greyhound, who loves to lean and just be around people. Rehn gets along well with other dogs, and he is cat friendly. Sincere thanks to those who have helped with Rehn's medical bills. Because of all of you and Helga's initial kindness, generosity and love of this special breed, Rehn (who, by the way, was named by the Simeone's after Ludwig Rehn, a heart surgeon) is getting a second chance at life.